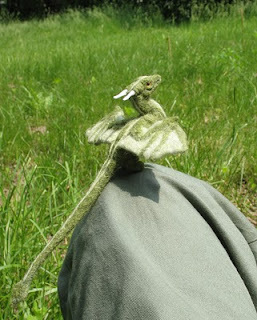 So why don't little green guys like this land on my knee when I go for a walk in the park? How does this person rate? Our last pic netted an extra scene from Eden Winters' Galen and the Forest Lord, and an excerpt from JL Merrow's Camwolf. With a track record like that, I am going with another critter pic! And someone tell me what kind of bait this person used -- I want one! Authors who have a ficlet or excerpt to explain, send it with news, covers, and links to be posted here. One hundred to one thousand words will do it. Fire Lizards aren't nearly as squeeful as what I've been sent by an author! You're gonna love it but first I have to format it!